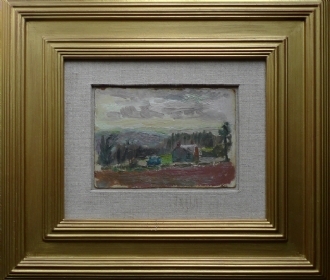 Oil on board measuring 4" x 5.75". Studio stamped and signed. Patrick George studied at the Edinburgh College of Art in 1941-42 and then studied at Camberwell School of Art and Crafts under William Coldstream in 1946-49. Taught at the Slade School of Art from 1949. In 1959 became the head of department at Nigerian College of Art and Technology in Zaria. Became Slade professor in 1985-88. Exhibited in group exhibitions such as Eight Figurative Painters, Mellon Center for British Art in Yale and elsewhere in America in 1981. A number of solo shows held at Browse & Darby from 1984. Arts Council. Retrospective at Serpentine Gallery was held in 1980. Arts Council, Government Art Colleciton, Tate Gallery and other public collections hold examples of his work. Patrick died April 2016.